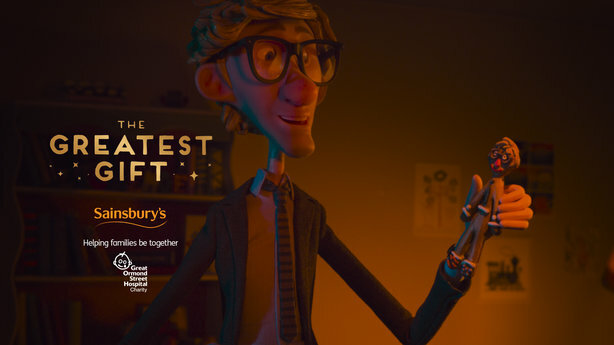 Sainsbury's has released its Christmas campaign film, a stop-frame animation epic with complete with an original song, sung by James Corden. ‘The Greatest Gift’ is a Christmas musical-style film released on YouTube and social media this morning. It tells the story of Dave, a hard-working and devoted dad, who comes up with an ingenious plan to make sure he can be with his family for Christmas. The film is set to the original song ‘The Greatest Gift For Christmas Is Me’, voiced by British actor Corden and composed by Bret McKenzie, a comedian, musician and producer who won the 2012 Oscar for best original song in The Muppets. The film was produced for Sainsbury’s by ad firm AMV BBDO, which also created last year’s Mog’s Christmas, although this will be the final partnership between the ad firm and Sainsbury’s. There are 26 characters in the film, including dave, and the sets and puppets took 16 weeks to build. It will be aired tonight for the first time during ‘I’m a Celebrity… Get Me Out Of Here!’ at 9.15pm as part of ITV’s ‘Proud to Present’ series. The supermarket has stuck with its Christmas tag line 'Christmas is for Sharing’, in keeping with previous campaigns. Cath Wilkins, head of consumer PR and corporate affairs for Sainsbury’, told PRWeek: "One of the key roles that PR plays in the delivery of our Christmas campaigns is ensuring that that the consistency of our 'Christmas is for Sharing' message remains at the heart of the campaign while highlighting our approach of not following a set formula in how we deliver that message." Wilkins said previous campaigns from Sainsbury’s, which include last year’s ‘Mog’s Christmas’ and its 2014 First World War epic, had all been popular but distinctive and said this year’s effort was a worthy successor in terms of consistency and surprise. She added: "We know the ‘Christmas is for Sharing’ message really resonates with customers and it is one that has universal appeal. In this year's ad, Dave is desperate to share more of his time with his family and I think that is something many people can relate to." The supermarket hopes the original song, which is available to dowload free from Spotify, will cement itself in people’s minds, helping to propel its campaigns into the hearts and minds of Christmas shoppers. Wilkins continued: "It's a brilliant song and when you have something that is written by an Oscar-winning composer and performed by an iconic British artist you'd think there were would be a good chance of it being a bit of a hit." This year’s charity tie-up is with Great Ormond Street Hospital, with the profits from in-store sales of a stop-frame animation kit for children and a themed gingerbread man going to the hospital. Shoppers will also be given an option to make a donation to the charity at the till. The money raised will be used to fund family accommodation for the parents or guardians of children at GOSH so they can be near them during their treatment. Sainsbury’s will also use its in-store brand walls to highlight the work of the hospital in helping sick children from all over the UK. Wilkins said: "PR has a significant role to play in highlighting the charitable element of the campaign...that's a message we really want to help communicate to customers." In the three hours after the launch of the new film, Sainsbury's Facebook page showed it had been viewed 216,000 times, with more than 5,000 shares and nearly 6,000 'likes' while its YouTube channel showed the film had been viewed nearly 70,000 times. According to Brandwatch, there have been more than 5,000 tweets about sainsbury's Chriostmas campaign so far, with the majority using the hastage Christmas is for sharing. Chris McCafferty (pictured above), founder of Kaper, said: ""Three minutes 35 seconds? In today’s attention deficit world, that’s not an ad, it’s a short film! Which I guess is the point. The story of time pressures and desire to do your best by your family will hit a chord with the British public and I suspect the ad will go down well. In a run-off of Sainsbury’s last three Christmas ads, I’d give 2014’s First World War film bronze, Dave silver and Mog the gold. I loved Mog." Andrew Bloch, founder of Frank, added: "Sainsbury's might have just stolen the show with this year's musical Christmas advert. They've called on James Corden, Hollywood producers and state of the art animation techniques to ensure that it has a worthy follow-up to last year's successful advert featuring Mog the cat." Misha Dhanak, co-founder of the Romans, said: "From office party twerking to snowflakes on the train line, the level of detail in Sainsbury’s offering that depicts the nuances of thoroughly modern life in Britain is impressive. It might be animated but actually, this could be the most realistic view of time-poor families in the run up to Christmas that we’ve seen so far this year. The inclusion of Karaoke King James Corden also makes it feel very of the moment. As we have now come to expect from Christmas campaigns, Sainsbury’s is sharing their Christmas with a charity, and what’s interesting about the partnership with Great Ormond Street Hospital is that money raised will go to the specific cause of building accommodation for visiting families. Being focused about what the donated money will achieve has created further depth and conversation to the campaign and a clear goal for those able to help.